Carnival | The Bloxwich Telegraph – incorporating The Bloxidge Tallygraph and Walsall North News. Founded 2006. Young and old alike have been having fun in Bloxwich in the run-up to the hugely popular annual village carnival which will take place on Saturday 3 August. 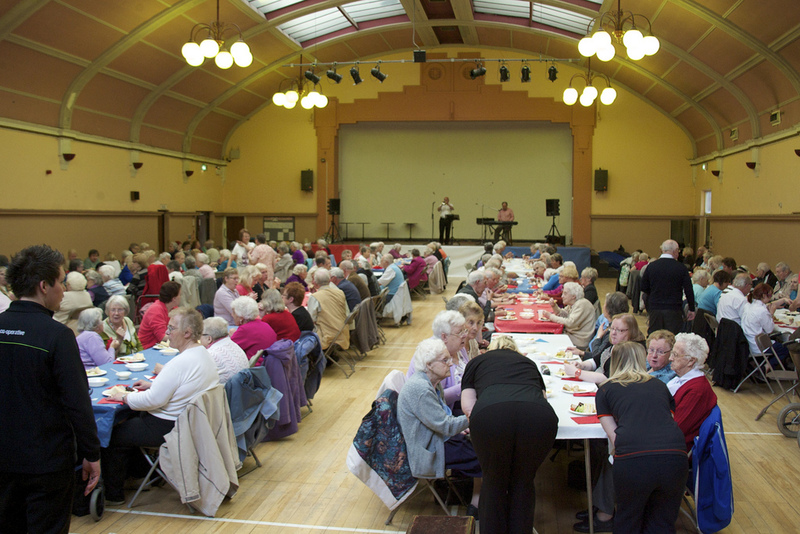 On Thursday 18 July more than 240 local old folk from Bloxwich, Leamore and Blakenall Heath were treated to a slap-up tea in the Art Deco surroundings of the historic Bloxwich Baths function hall and entertainment from both professional performers and youngsters from the Mirus Academy (Beechdale) and Walsall Academy (Lichfield Rd, Bloxwich) in the form of singing, music and dance. 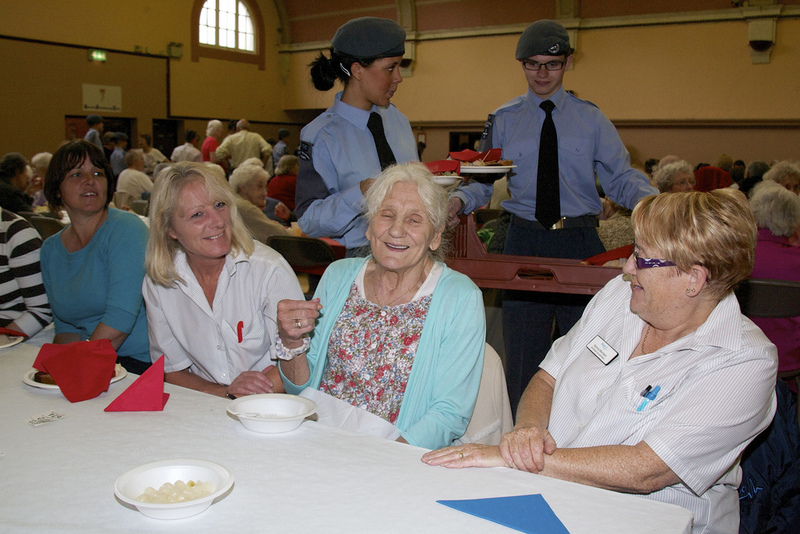 This free Senior Citizens’ Party, provided from funds raised by Bloxwich Carnival and organised by Bloxwich Carnival Committee was presented on a voluntary basis with the help of local groups such as Bloxwich Rotary, 196 Squadron ATC, West Midlands Co-operative Society and Bloxwich councillors and others, and is an annual tradition dating back to the mid 20th century. You could be Queen of Bloxwich! The Mayor, Bloxwich Carnival Royalty and a very special coach and horses last year. That time of year is fast approaching once more, when the selection of the new Bloxwich Carnival Queen for 2013, along with a new Princess and Rosebud, will happen. And this year the Queen choosing event wiIl be even more prestigious than before, taking place in style at Bookmark Bloxwich Theatre (aka Bloxwich Library Theatre) in Elmore Row, Bloxwich, on Thursday 23rd May 2013 at 6pm. The age categories (as of 23rd May 2013) for entrants are Rosebud 7-10 years, Princess 11-15 years, and Queen 16-24 years of age. Contestants MUST live in the Walsall/Bloxwich area and their Parents/Guardians pay their Council Tax to Walsall Council. The Carnival Queen, Princess and Rosebud will be required to attend the Carnival Day, where they will be crowned. Winners, in particular, the Carnival Queen will be expected to attend at least 3 community events during their year including Carnival Royalty Selection 2014 and Senior Citizens’ Party. The Carnival Queen automatically becomes a member of the Bloxwich Carnival Committee and will be expected to attend regular meetings. 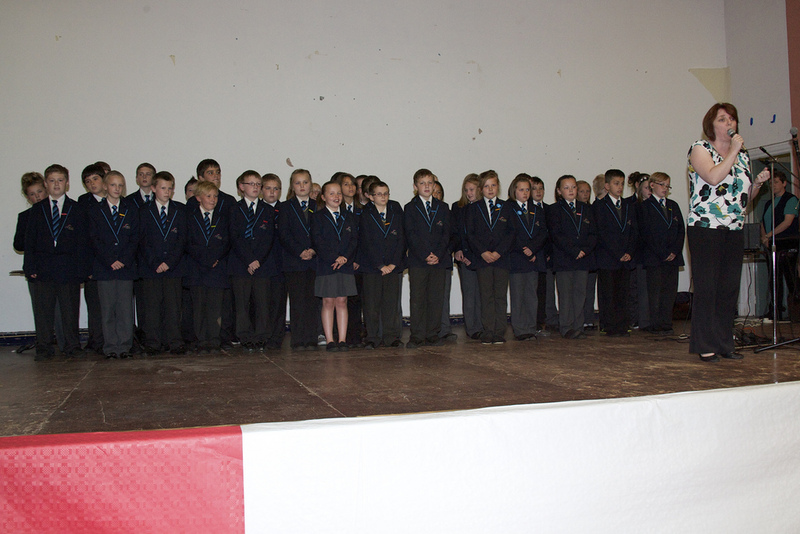 Winners will be representing the Bloxwich community as Ambassadors. Holders of similar titles in other towns/areas during the carnival year will not be eligible to apply as this could lead to conflicting commitments. Previous holders of titles are not eligible to re-enter for the same category but may enter another group provided they qualify by age. Entry forms are available in person from Sweet & Fancy (during retail hours) in Park Road or from Bloxwich Library in Elmore Row. Full details and conditions of entry are included in the form. The form and a poster can also be downloaded for printing in pdf form from The Bloxwich Telegraph via the links below, and from the Rotary Club of Bloxwich Phoenix website. Bloxwich Carnival itself will take place on Saturday 3rd August, from 12 noon, at King George V Playing Fields, Bloxwich, as traditional. If you do not already have Adobe Acrobat Reader or equivalent on your computer, you can download it via this link: Adobe Acrobat Reader. It’s Bloxwich Carnival this Saturday! Diamond Jubilee street parties may be over but visitors to Bloxwich this weekend are being guaranteed a right Royal day out courtesy of the village’s annual carnival. Organisers Bloxwich Carnival Committee switched the date of the popular event from August to Saturday 16 June to carry on the feelgood factor created by recent celebrations to mark the Queen’s 60 years on the throne. And while Her Majesty may not be in attendance visitors will be still be able to rub shoulders with Royalty by meeting Bloxwich Carnival Queen Alice Jones. In keeping with the Royal theme, former Bloxwich Carnival Queens from years gone by will also be in attendance. The event, which runs from 12 noon until 5pm is supported by Walsall Council’s parks team, and is said by organisers to be the biggest in the West Midlands. John Millard, Walsall Council senior parks ranger, said: “Bloxwich Carnival Committee have waived the admission fees this year so all the family can enjoy a great day out. Joining the Carnival Queen will be Bloxwich Carnival Princess Amelia Ellis and Rosebud Megan Leigh Small. 2012 Bloxwich Carnival Queen Alice Jones (centre) and attendants Princess Amelia Ellis (left) and Rosebud Megan Leigh Small. Bloxwich Carnival will get under way with a short parade led by the Carnival Queen and her attendants who will travel in a horse-drawn carriage leaving the rear of All Saints Church, Bloxwich, at 12 noon. They will travel along High Street and into the Stafford Road entrance of King George V Playing Fields (where the event takes place) to make their way to the podium where they will be formally crowned by local dignitaries at 12.30pm. An exciting and entertaining line-up of arena events this year includes spectacular motorcycle stunts and leaps from top freestyle team UK FMX, speciality act Bruce Airhead and Zumba demonstrations – follow this link for the timetable. As is traditional, the famous Pat Collins Fun Fair will also be on site. While admission, arena events and children’s entertainment are free, charges will apply on attractions and on the Pat Collins Fun Fair. For more information phone: 01922 654893/4/5/6 or 07736 388409. Bloxwich Carnival will as always be covered by The Bloxwich Telegraph, so be sure to look out for a photo feature and Flickr album afterwards! A Right Royal Carnival in prospect at Bloxwich! Crowds of local people gathered excitedly at St John’s Methodist Church in Bloxwich on Saturday to witness a fine old local tradition carried out – the choosing of this year’s Bloxwich Carnival Queen and her ‘royal attendants’, the Carnival Princess and Rosebud. And the event proved ideal for the official announcement that another right royal occasion – Bloxwich Carnival itself – would pay loyal tribute to Her Majesty Queen Elizabeth II, celebrating her Diamond Jubilee by offering this year’s carnival-goers FREE admission! The carnival is being held, as is traditional, in King George V Playing Fields, Bloxwich, but earlier than usual, on Saturday 16 June at 12 noon, falling nicely just after the official nationwide celebrations of the Jubilee. Carnival Committee Chairman Terry Bate congratulates new Bloxwich Carnival Queen 2012 Alice Jones, Princess Amelia Ellis and Rosebud 2012 Megan Leigh Small. “Bloxwich Carnival Committee are proud to announce this one-off gesture in honour of Her Majesty’s Diamond Jubilee. And in the spirit of the occasion this year’s Bloxwich Carnival Queen, Princess and Rosebud were judged by several past ‘queens of Bloxwich’ as well as one of our local Councillors. “We were delighted that 1950 Carnival Queen Mrs Elsie Walker-Biddle, 2011 Queen Miss Abigail Nicholls, and 2003 Queen Ms Tammy Scale were able to join Cllr Fred Westley in choosing the three wonderful young ladies who will represent Bloxwich and district for the coming year. The 2012 Bloxwich Carnival Queen Judges, L to R: Tammy Scale (Carnival Queen 2003), Abigail Nicholls (Carnival Queen 2011), Mrs Elsie Walker-Biddle (Carnival Queen 1950), Cllr Fred Westley. The Queen Choosing event was co-organised by Bloxwich Carnival Committee and the Rotary Club of Bloxwich Phoenix, who are strong supporters of the carnival, and the event was compered by Troy Allen of Rotary. The judges chose the 2012 Bloxwich Carnival Queen Alice Jones, Princess Amelia Ellis and Rosebud Megan Leigh Small (see first picture above), who have all studied at Lower Farm Primary School, Little Bloxwich, from more than twenty excellent entrants all-told. Bloxwich Carnival itself will begin on the day with a short parade led by the Carnival Queen and her attendants who will travel in stately style in a horse-drawn carriage, starting at 12 noon from the rear of All Saints Church, Bloxwich, then along High Street and into the Stafford Road entrance of King George V Playing Fields when they will proceed to the podium where they will be formally crowned by local dignitaries in a Right Royal Ceremony at 12.30pm. Bloxwich Carnival promises visitors a right Royal welcome in 2012 as it moves to a June slot to tie in with the Queen’s Diamond Jubilee year celebrations. 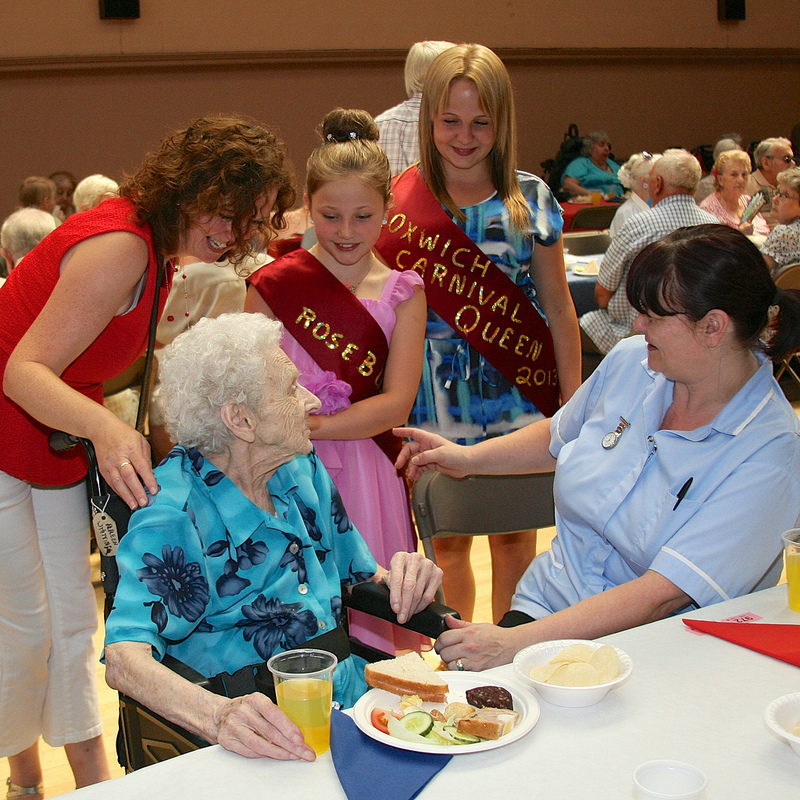 This year’s theme embraces the landmark anniversary by inviting Bloxwich Carnival Queens from years gone by to enjoy the event which is being held on Saturday 16 June. And the competition to find a new Carnival Queen, Princess and Rosebud will get underway on Saturday 21 April at St John’s Methodist Church hall in Victoria Avenue, Bloxwich, from 11am. Budding Bloxwich ambassadors will be invited to step into the shoes of teenager Abigail Nicholls who has relished her role as 2011 Carnival Queen. Carnival Princess Lucy Kirk and Carnival Rosebud Phoebe Willetts will also be stepping down. Contestants must live in the Walsall/Bloxwich area and need to be aged 16-24 for the Carnival Queen role, 11-15 for Carnival Princess and aged seven to 10 to be considered as a Rosebud. The annual event is organised by Bloxwich Carnival Committee and supported by Walsall Council. John Millard, Walsall Council park ranger, said: “Abigail did Bloxwich proud last year and we’re looking for a worthy successor to take her place in 2012. Bloxwich Carnival traditionally draws thousands of visitors from the immediate community and beyond and organisers claim it is the Midlands’ biggest. Application forms can be downloaded via the links below or collected from Bloxwich Co-op Travel in High Street or Bloxwich Library in Elmore Row. Former Carnival Queens who would like to attend this year’s event can contact John Millard on 07736 388409. If you do not have Adobe Acrobat Reader for pdf installed, you can download it via this link. You can be Queen of Bloxwich! A call is going out to the young ladies of Bloxwich and district to step up, stand out and represent their home – while having lots of fun – in the premier local event of the year: Bloxwich Carnival! And there’s a chance for three girls to be crowned Carnival Royalty, becoming part of a fine local tradition which dates back to the end of the Great War, with the opportunity to become the new Bloxwich Carnival Queen, Princess or Rosebud for a year! Organisers Bloxwich Carnival Committee have announced that the 2012 Carnival Royalty will be selected in an exciting contest taking place at 11am on Saturday 21 April at St. John’s Methodist Church Hall, Victoria Avenue, Bloxwich. And in a very special royal move this Diamond Jubilee year, most of the judges will be past Bloxwich Carnival Queens, including Elsie Biddle who, as Elsie Walker, became Bloxwich Carnival Queen in 1950 (see photograph above including Elsie and the 2010 and 11 Bloxwich Carnival Queens plus the 2011 Princess and Rosebud). Entries are now open, and forms and posters may be downloaded via the links at the end of this news item, including full details and the terms and conditions of entry. So why not give it a go? The Carnival Queen, Princess and Rosebud will be required to attend the Carnival Day, which this year is Saturday 16 June, when they will be crowned by local dignitaries in a grand ceremony at the carnival ground, King George V Playing Fields. They will then be free to enjoy the rest of the carnival, which this year will be even more spectacular than before! Winners, in particular the Carnival Queen, will also be expected to attend at least 4 community events during their year, including Carnival Royalty Selection 2013 and the Senior Citizens’ Party. The Carnival Queen automatically becomes a member of Bloxwich Carnival Committee and will be expected to attend regular meetings. Completed application forms must be handed in for Bloxwich Carnival Committee c/o Bloxwich Co-op Travel, 240, High St. Bloxwich. WS3 3LQ or hand in to Bloxwich Library, Elmore Row. Bloxwich by Saturday 14 April.